When you have decided to book with Vista Yacht Charters, we will do everything possible to make your charter a great experience. Wildest Dream is a 36 foot Four Winns® Vista Cruiser with a generous deck area that enables passengers to lounge, dine, and enjoy excellent views of the surrounding ocean and waterfront. Accommodations allow for maximum comfort & privacy for 6 passengers and crew. Captain: Captain Steve Briggs is licensed under the United States Coast Guard as a U.S. Merchant Marine Officer (License No. : 1194307). Capt. 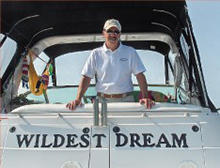 Steve has logged over 40 years of boating experience on small and large lakes in the New England area and on the coastal waters from Martha’s Vineyard to the shores of Kennebunkport, Maine. Capt. Steve has helmed both power and sail boats ranging from 17″ to 36″ and provides On-Board Training. Crew: We currently have three First Mates enrolled in The Maritime Consortium, Inc. The Certificate of Compliance lists our First Mates with the United States Coast Guard’s mandatory drug testing regulation as contained in 46 CFR part 16. Our First Mates are also CPR certified/Marine Red Cross certified.